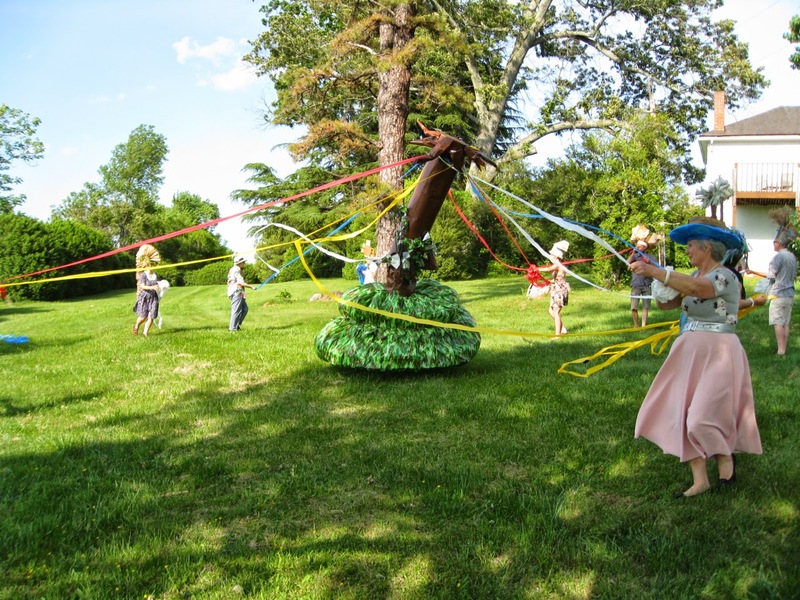 Last week VCCA Fellows Pat Oleszko and Karin Fleischer, along with assistance from other VCCA Fellows in residence, staged an idyllic fête galante on the green between the swimming pool and woodshed. 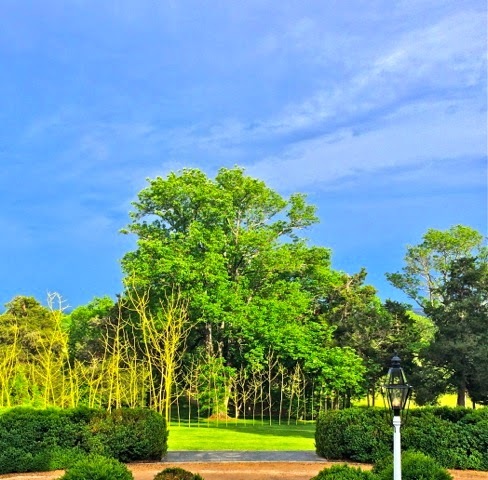 The area was beautifully decorated with streamers and bunting, complemented by Karin’s rice paper haiku posted to trees and an Arcadian feast she prepared, spread out on the great stump of a tree felled by the Derecho of 2012. For the final bucolic touch: a flock of sheep, crafted by Pat from folding chairs and curled strips of paper. Pat engineered and directed the performance aspect of the afternoon, providing handmade headwear to Fellows and staff–crafting several bespoke pieces on the spot. Elaborately outfitted as a tree, she led a streamer-waving group procession preceded by composer Eric Moe on didgeridoo. Writer Tom Piazza provided a banjo soundtrack during the leisurely picnic, which included a generous punch bowl of sangria. The magic of VCCA's The Commission event on May 10, 2014 was enhanced this year by the unexpected appearance of VCCA's current Fellows in residence sporting amazing headgear engineered and created by Pat Oleszko, also in residence. As the Fellows climbed down from the shuttle bus and donned their chapeau du jour, the party was punctuated with the sparkle of color, humor, and unexpected design feats made from cast-off and recycled materials. Oleszko herself was dressed as "Garlic O'Hara" in full ante-bellum garb, featuring a great wig made from the pages of a discarded book. At this year's event, name tags were not needed to distinguish the VCCA Fellows from the other guests. 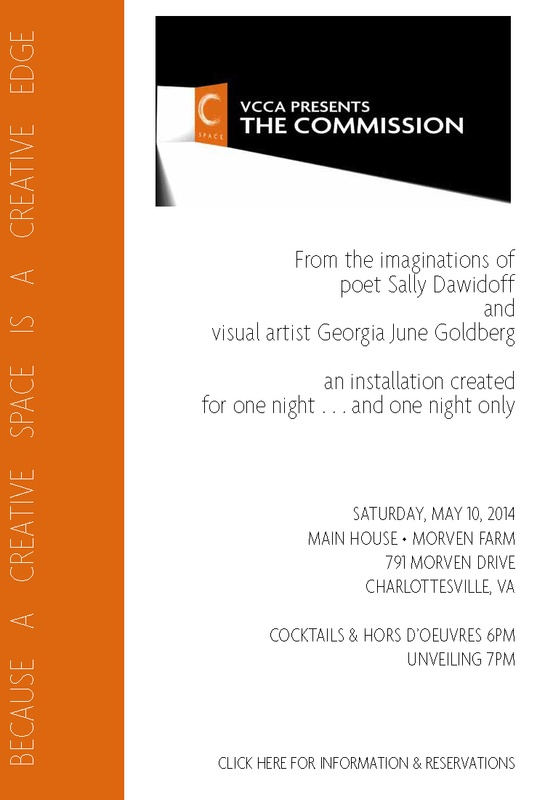 Over 200 friends and supporters of VCCA gathered at Morven Farm on Saturday, May 10, for the unveiling of The Commission 2014. Coming to Know What We've Always Known, the beautiful installation by poet Sally Dawidoff and visual artist Georgia June Goldberg, ran the length of the front lawn of the historic Main House at Morven. Over 100 brightly painted fallen saplings undulated in a line across the lawn. As guests walked the line of trees, the spoken words of poet Sally Dawidoff seemed to emanate from the trees. It was a magical scene. The installation was the centerpiece of an evening that included gypsy jazz by the Rick Olivarez Trio, delicious food by L'étoile, and a live auction that offered trips to such locales as a nature preserve in South Africa and the Thelonious Monk Institute of Jazz All-Star Gala and Trumpet Competition in Los Angeles.